Senate Majority Leader Jake Corman (R-Centre) on Senate approval of sweeping redistricting and appellate court election reform in Pennsylvania. House Bill 56 ensures that birth parents have access to adoption-related counseling services when relinquishing parental rights and placing a child for adoption. House Bill 994 clarifies that the sales of telephones, telephone handsets, modems, tablets and related accessories are not subject to the gross receipts tax. House Bill 1659 sets work requirements for participants in the Supplemental Nutrition Assistance Program and prohibits DHS from applying for waivers of the work requirements without General Assembly approval. House Bill 153 proposes an amendment to the state Constitution for reducing the size of the General Assembly. The Senate approved legislation Wednesday that changes the way legislative and Congressional district boundaries are drawn in Pennsylvania. The maps would be required to be created without the use of partisan data, prior election results or the addresses of specific individuals to prevent any undue political influence in the process. The legislation incudes an amendment sponsored by Sen. Ryan Aument (R-Lancaster) that changes the way that appellate court judges are elected. In current practice, members of the state Supreme Court, Superior Court and Commonwealth Court are elected via a statewide vote. Senate Bill 22 would divide the state into judicial districts to ensure a broader range of regional interests are represented on Pennsylvania’s highest courts. Legislation sponsored by Sen. Gene Yaw (R-Lycoming) requiring medical professionals to adhere to strict guidelines when prescribing opioid medications was approved by the Senate on Tuesday. The Senate on Wednesday approved legislation sponsored by Sen. Elder Vogel (R-Beaver) to promote telemedicine in Pennsylvania as a way to overcome barriers to quality patient care and reduce the costs of those services. The Senate on Wednesday gave final approval to legislation sponsored by Sen. Pat Stefano (R-Fayette) aimed at helping local redevelopment authorities fight community blight. The Senate approved legislation sponsored by Sen. John DiSanto (R-Dauphin) on June 11 that would expedite the voluntary termination of parental rights to speed up the legal adoption process. The Senate Agriculture and Rural Affairs Committee, chaired by Sen. Elder Vogel (R-Beaver), approved two Resolutions on Wednesday. The Senate Appropriations Committee, chaired by Sen. Pat Browne (R-Lehigh), approved eight bills June 11.
approved three bills on Wednesday. The Senate Consumer Protection and Professional Licensure Committee, chaired by Sen. Tommy Tomlinson (R-Bucks), approved five bills on Tuesday. The Senate Education Committee, chaired by Sen. John Eichelberger (R-Blair), approved three bills on Tuesday. The Senate Environmental Resources and Energy Committee, chaired by Sen. Gene Yaw (R-Lycoming), approved six measures on Tuesday. The Senate Finance Committee, chaired by Sen. Scott Hutchinson (R-Venango), approved House Bill 939 on Wednesday. The bill provides for the forfeiture of a public pension when a public employee is found guilty of, or pleads guilty or no contest to, an offense classified as a felony or punishable by a term of imprisonment exceeding five years. The Health and Human Services Committee, chaired by Sen. Lisa Baker (R-Luzerne), approved three bills on Tuesday. 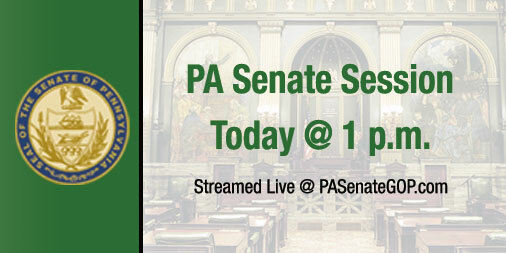 The Senate Majority Policy Committee, chaired by Sen. David Argall (R-Schuylkill), held the second of two briefings on welfare reform efforts on Tuesday. The Senate State Government Committee, chaired by Sen. Mike Folmer (R-Lebanon), approved two bills on Wednesday. The Senate Urban Affairs and Housing Committee, chaired Sen. Tom McGarrigle (R-Delaware), approved two bills on Wednesday. The Senate Veterans Affairs and Emergency Preparedness Committee, chaired by Sen. Randy Vulakovich (R-Allegheny), approved two bills on Wednesday.